Have you ever wanted to try aerial or learn to flip upside down? Join Sarah on Friday, May 10th at 6:30 for a Intro to aerial mini-workshop. Learn the basics of aerial in a safe environment where we will cover some of the most common yoga poses in an aerial hammock. The last 15 minutes of class we float in savasana with a guided meditation. Following the class will be the monthly potluck so feel free to hang around for the community gathering. Join Sarah and Bethani at the Mountain Island Park Trail for a 3 mile hike with a 30 minute yoga practice and guided meditation. We will meet at the trail head, 146 Mountain Island Road, just before 10 am and stop midway for our practice in nature. Instead of bringing a yoga mat just plan to bring a towel and bottle of water. Join Martha for this 2 hour Unity Yoga workshop-style class designed to help you discover your arm and upper body strength, bringing your arm balance practice to the next level. Show up so we can play on the mat together, experimenting with symmetrical and asymmetrical postures, forearms, hands, and heads - the possibilities are endless! This is an intermediate to advanced level class, consistent practice of Unity Yoga or a strong consistent Slow Flow or Vinyasa Flow practice is strongly encouraged to participate. You do NOT have to be able to do any of the arm balances prior to attending, that's what the class is for! You will have the building blocks and the understanding of each pose by the time you leave, even if you aren't flying yet. Yoga + Coffee at Catawba Coffee Co.
Join Rachael Harper + Irene Pharr for Yoga + Coffee at Catawba Coffee Co! The class will be accessible for all levels and all bodies so come as you are. $8 gets you a 60 min Yoga practice with Rachael + one Medium cup of coffee (or tea) from Irene. Space is limited, register now to hold your spot! Our Kids Summer Yoga Camp is led by Jheni Solis and assisted by her daughter Jade. Your child will have a blast with these ladies doing yoga-related arts and crafts as well as learning various styles of yoga, including Aerial Yoga and Partner Yoga! Spring is the perfect time for cleansing!We often take this opportunity to clean out the clutter in our home or do some sort of spring cleanse for our diet,but what about overall lifestyle? What can we do to make our healthy habits stick? 'Dinacharya' means 'Daily routine' in Ayurveda. Just like yoga, creating lasting change is a daily practice. Dinacharya is a way to begin implementing small daily habits in order to be successful at creating lasting change in our lives and health. At this workshop you will learn about Ayurvedic daily habits that can help you feel better each day and have more clarity in your life to achieve your goals and stay on track. Workshop participants will also receive a small bag of tools to help you create a dinacharya routine that works for you. Unity Yoga is a wonderfully complex practice that is brilliantly designed to trick your mind, confuse your nervous system, and clear negative energy, creating positive forces so you can enjoy a wonderfully deep, healing savasana. Join Martha in January as we break down the asana (postures) and pranayama (breath) of a sequence that contains all ranges of movement. Yoga is technique and building blocks - many of us are taking shortcuts to achieve postures that are not meant for YOUR body. Unity yoga helps you understand your stable body and its limitations, how to overcome roadblocks you may encounter safely. After you practice streamlining your Unity practice, (6:30pm Tue + Thu with Martha), we will meet in February and take the same sequence and postures to the next level dialing down to a true meditation of movement, bringing the postures to the edge according to your range of movement so you can achieve the most from your practice. March, continues the layering with Mantra, advanced postures, and flight. ONLY 17 spots available, this practice WILL sell out, so register early! The word "chakra" refers to one of many energy centers in the body. Originating from Sanskrit, it literally means “wheel” by association with its function as a vortex of spinning energy interacting with various physiological and neurological systems in the body. In this workshop, Jheni will focus on the 7 main chakras, which run along the spine, beginning at the base and ending at the crown of your head. *1.5 Contact Hour CEUs available for Yoga Alliance registered instructors. Join us for our annual New Year's Eve Flow + Let Go class as we transition into 2019! This year Rachael + Natalie are pairing up to bring you an accessible Flow followed by a lovely, grounding Stretch + Restore practice. 90min practice, extended savasana, donations only. Join Katherine for a donation-based, experiential workshop of guided meditation, journaling, and visioning exercises. Instead of creating new year's resolutions based on "fixing" what's "wrong," tune into a vision for cultivating your highest self and create a visual reminder that you can keep with you throughout the year. We'll provide tea and some art supplies, but please bring a journal or notebook. 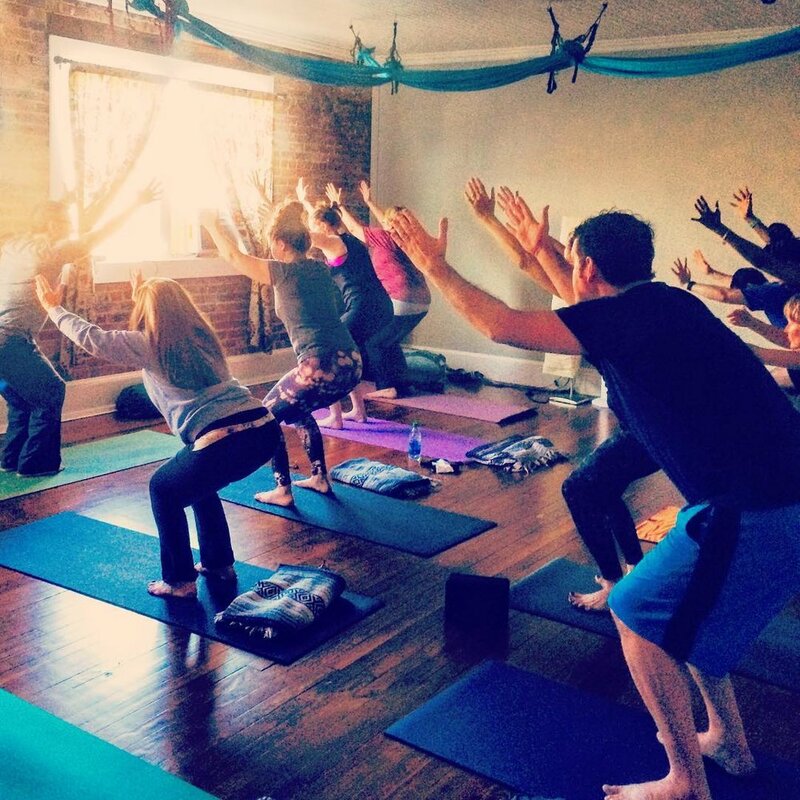 After the workshop, stay for the 4PM Stretch and Restore class to start your journey into the new year! Explore your deeper purpose and learn tools for balancing your mind and body. We will explore the philosophy and science of the energy centers before lunch, then give you some time to "digest" before exploring yoga tools to work with your chakras using sound, breath, postures, and meditation to support healing and balance. 11a-12:30p Understanding the Chakras -- this introductory section will be open on a donation basis to those who are interested in learning about chakras, but are not ready to invest in the full workshop. Rhonda will lead you through a relaxing aerial yoga workshop. The swing is set low to the ground so students can rest and enjoy stretching using the support of the hammock. The class ends with a nice long floating yoga nidra (guided relaxation). Space is limited, register now through the events tab. Small Business Saturday is the Saturday after Thanksgiving and is a day to celebrate and support small businesses in your community! This year on Small Business Saturday, we will have our regular 8:15 All Levels and 9:30 Slow Flow classes, and we will open the boutique from 9am-2pm. We’ll be offering discounts on select retail items, services, and class passes. Gift certificates will be available! Join us for our monthly community potluck after the 6:30pm Happy Hour class. Feel free to bring a dish or beverage to share, Thanksgiving leftovers welcome! Our Happy Hour Flow class with Rachael will be gentle and accessible this evening with the intention to aid healthy digestion. Beginners are welcome, so bring your Thanksgiving guests! Join Rachael Harper for this accessible, all levels flow class designed to ignite your digestive fire (agni) on Thanksgiving morning! Just $8, all are welcome. Register Now through our regular class schedule. Do you have a case of the Mondays ... any or every day? "Ummm, yeah....I'm gonna need you to" come to this workshop! As yoga students, we often gravitate to nutrition and "natural" medicines to help us thrive. For many of us, this is new territory and it can be difficult to make sense of all we hear. If you have a serious medical condition, this workshop is not a substitute for working with a qualified healthcare professional. What this workshop does offer is tools to begin a safe exploration of healing plants. Defining the types of plant preparations: teas, tinctures, flower essences, essential oils, and more! Simple herbal preparations to optimize your wellness during cold and flu season Each student will leave with a goody bag that includes a booklet of checklists and recipes to help them begin to explore on their own. Join Natalie for this Props 101 workshop. Learn what they are, why we use them, and how to incorporate them into your practice. Do you feel less grounded than usual this time of year? Do you normally get sick between August + December? Are you looking for a change in your diet or lifestyle whether for better energy or weight management? Ayurveda means 'to know life' and is an ancient art of living well. Ayurveda approaches wellness according to the individual, using daily and seasonal foods and routine to bring your body + mind into balance. In this workshop, you will learn seasonal lifestyle, yoga, and diet recommendations for maintaining optimal health throughout fall and early winter. We will begin at 6:30 with 5Elements Earth Flow practice. This practice will be open to the public. Special Guest Teacher (and an OTY favorite) Angie Benton will lead this week's Self-Care Sunday class including Yoga Nidra and Sound Therapy. This class is not to be missed! This class is donation-based, please pay what you wish or what you can for this offering. Yoga Nidra is a guided Yogic sleep + meditation practice for rejuvenation, accompanied by crystal singing bowls and bells. Please feel free to bring any comfort items from home - blanket, pillow, journal, etc. This workshop will provide you with tools to help you develop a daily meditation practice. We will cover walking meditation, metta, mantra + breath, prayer, guided relaxation, and other techniques from a variety of traditions. Each participant will receive recordings of a few guided meditations and a resource guide for connecting to group meditation opportunities in the Charlotte area. This workshop is donation-based, please feel free to give what you feel is right based on the value you receive from this class. Awaken Gallery in downtown Mt Holly is teaming up with On Track Yoga to offer a Slow Flow yoga class in their gallery while artists sketch the flow. After the hour long class led by Rachael Harper, the students can discuss their impression of the experience while viewing the artist's perspective over wine and refreshments! The practice will include slow, mindful movement using long holds and fluid repetition to build strength and create stability and grounding. A meditation in motion. No prior experience is needed to participate.